England was our first love. Good Old England. There was no way for us who studied English to go and live there, which was our impossible dream. We got to learn so much about it from books and recordings. Our son studied English by listening to Gielgud’s recitals of Shakespeare’s poems. He imitated Gielgud so well that we often could not tell if it was the actual recording or our son’s voice coming from his room. A friend of ours Violetta Boft, a well-known ballet dancer with the Moscow Art Theater, came to dinner with her friend, artistic director of the theater. To entertain our guests, we asked our seven-year-old son to recite a piece by Gogol “Evenings on a Farm Near Dikanka.” Viola’s friend was impressed so much that he wished our son were one of his students. 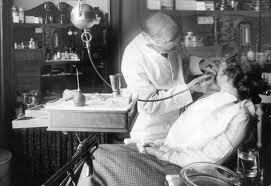 Iosif Solomonovich Shapiro and Emiliya Mikhailovna, his wife and his loyal assistant, worked dental miracles. They occupied a spacious, six-room luxury apartment in a pre-1917 building, an example of the pseudo-Mauritanian architechtural style — that was where they lived and had a two-room dental office. I remember he used a wooden hammer to insert a metal rod in the root canal. And I still have the tooth to prove it. We were not the only ones who valued his expertise. His other patient was Josef Stalin. Dr. Shapiro was his personal dentist. Shapiro never talked about it, and we never asked him about it. Later, however, already in New York, we read a more detailed description of Stalin’s personal dentist, Dr. Shapiro, in memoirs of Anatoly Rybakov, author of the widely acclaimed “Children of the Arbat”). Some time passed, and I needed to see a dentist. “You remember we have the name of the dentist they gave us on the boat. Go see him,” my wife suggested. But why should I go to Manhattan? In Riverdale, where we live, there is a dental office every two blocks. So I went to see one of them. The filling lasted for a few days. I went back to that same office and had a new filling, which replaced the old one. And that, too, I also lost in a few days. I had yet another appointment with her. She said I developed an infection and suggested that the tooth should come out. But all I needed, I thought, was a filling in an otherwise perfect tooth which had never bothered me. That was when I went to see Robert Lichtenstein. And since then, he is the only dentist our family trusts. Latest, modern equipment? Of course, they got all of that. What is rare is talent, which no money can buy. Do you remember the film “Young Dr. Kildare”? “You can track a hundred docs but one and only one can have this mysterious ‘something’ I saw in one. And you have that one,” says Dr. Gillespie, a seasoned older physician, addressing the young medical doctor. I cannot describe in better words the mysterious ways of Dr. Lichtenstein. Latest equipment you can buy, talent you cannot. Dr. Lichtenstein’s talent is highly recognized. He currently maintains an office in Manhattan and serves as the Clinical Director of Affiliated Cosmetic Dentists of New York, located on Lexington Avenue. He is a member of the International Congress of Oral Implantologists and is a lecturer on advanced implantology at several national dental conventions, including the prestigious American Dental Association. Born in France and immigrating to the United States at age 10, Dr. Lichtenstein’s early multicultural background contributed greatly to his personality. He is fluent in several languages, including French and Hungarian. And it is this rare, unique quality, that mysterious “something” Dr. Gillespie talked about that I found in Dr. Lichtenstein.